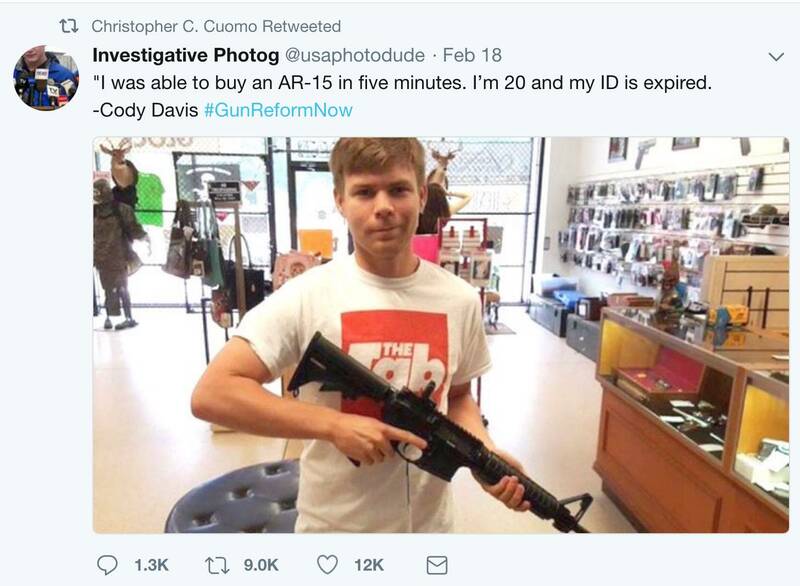 On Tuesday, CNN's Chris Cuomo retweeted a Monday tweet by Cody Davis, who claimed that "I was able to buy an AR-15 in five minutes," even though "I’m 20 and my ID is expired." The young man's account of what he supposedly did 20 months ago indicates that he never genuinely began the gun-purchasing process. One might forgive Cuomo for a careless retweet; but once sharp criticism poured in, he showed that he bought into Davis's false narrative. ... I then asked if I could take a quick picture of it to help me decide ... By this time, I thought it was pretty surprising how I was never asked about my age, intent, or experience with firearms. Davis had been in the store all of 2-3 minutes, yet it was a problem that he didn't get the third degree for looking at a legal firearm. After I set the gun down to take a photo of it, the manager of the store walked up and finally asked my age. ... (at age 20) I could buy a shotgun or rifle as long as it had a stock. I was taken by surprise a bit. Imagine that. The store employees knew he wanted a large firearm, initially believed him when he said he was old enough to buy one, and suggested a popular rifle. After exchanging conversation for about five minutes, I asked, “Can I buy this today?” The seller replied, “Yeah, sure ..."
Davis's tweeted five minutes was up. The store had not begun going through the five-page paperwork and background checking process, which "takes longer than 15 minutes." The fact is that "he wouldn't have even made it through a standard background check with an expired license." Yet he claimed in his tweet that he was already "able to buy." ... if a 20-year-old college student can walk into a gun shop and be out in minutes with an AR-15, and you believe nothing needs to be changed, you need help. The answer to the New Day host's question is "No." Time Warner's standards (h/t Charles Glasser at Instapundit) demand that its journalists "be fair and honest and to confirm the facts." 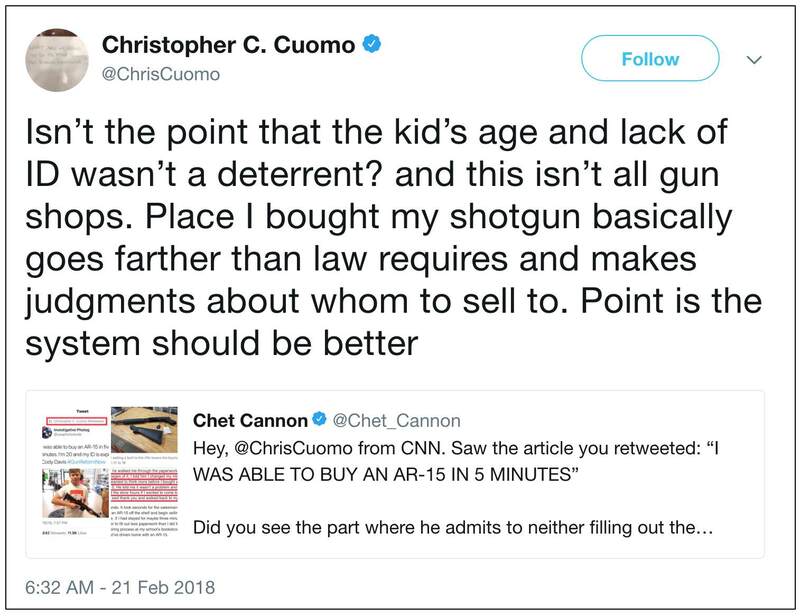 Cuomo's retweet and his defensive, lame follow-up tweet are none of the above.